Due to its all-steel design, the Baby Desert Eagle II is one soft-shooting pistol—even with stout loads. 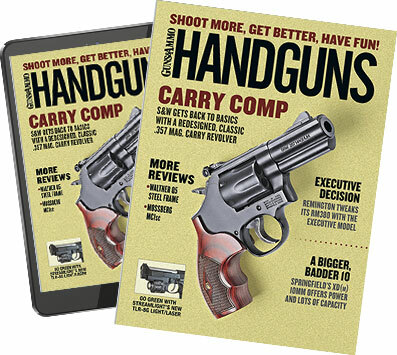 It may surprise you to discover that there was a 9mm handgun that actually drew praise from the late Jeff Cooper, that pistol being the CZ-75. Back when the pistol options were few and polymer was only for use in consumer electronics the 75 offered several benefits: You could carry it cocked and locked; you could ease the hammer down and use it double-action on the first shot; and it held a lot of ammo. The pistol exhibited good accuracy, helped by the excellent DA/SA trigger. The best part was the grip. The CZ-75 possessed the most ergonomic handgun grip to be had, but it was made by a then-Communist country, Czechoslovakia, so you couldn't get one here for many years.. However, it was so popular that handgun makers who could export to the U.S. simply copied it and shipped clones here. One of those was a company known as Israeli Military Industries, now known as Israeli Weapon Industries or IWI. It's the manufacturer behind the new Baby Desert Eagle II, which is imported by Magnum Research, and it's a gun that owes a ton to the CZ-75. IWI has a couple of decades of experience at making this model, and it shows. Available in 9mm or 40, the Baby Desert Eagle II is listed as being 38 ounces. My sample weighed 41 ounces with empty magazine inserted, and that's a lot if you're accustomed to polymer-frame pistols that weigh on the order of 22 to 24 ounces. However, sometimes a bit of heft is a good thing- like when you're shooting your handgun. Some of the USPSA/IPSC Grand Masters are known to shoot handguns even heavier than the Baby Desert Eagle II. The pistol's safety drops the hammer and also de-links the trigger from the firing system, so if it's in the down/Safe position, the gun will not fire. The weight is also increased by the recent addition of an accessory rail, a place to park a light or laser. It too is steel (an integral part of the frame) and certainly adds a couple of ounces to the total. There is room enough there for most any light or laser, and a really compact one would be barely noticed. Up top we have a slide that rides within the frame rails. Unlike the 1911 and other Browning designs, the slide rail grooves are inside the frame, and the result is an interesting combination. For its size, the Baby Desert Eagle II's slide is a bit lighter than, say, a 1911, and the axis of the bore is closer to your hand than it would be in a 1911. On top of that slide we have combat sights (low and ramped) set into transverse dovetails. If you need to adjust, you simply drift them from side to side. The top of the slide is grooved between the sights to draw your eye and align the pistol as you present it on the draw. The barrel is built with an integral ramp, and the locking and unlocking are done by means of a kidney-shaped slot cut into the lug under the chamber. Rather than use a separate link, or an open slot like the Browning Hi Power (and all the derivatives thereof), the Czech designers went with an enclosed slot, the kidney-shaped cam slot. The barrel and slide design also dispenses with a bushing, the slide is bored for the barrel, and the barrel diameter is matched to the slide. It is a precise way to make slides and barrels, although it does rather limit the options of a gunsmith. The barrel has polygonal rifling. The extractor is a simple external extractor, pivoting on a pin driven down into the slide and actuated by a spring at the rear. The curved trigger helps you pull straight through in double-action mode. The front of the trigger guard is squared and grooved. The safety is on the slide, ambidextrous, and is a hammer-dropping and de-linking safety. That is, it blocks the firing pin and drops the hammer, and if you leave it down, it takes the trigger out of the firing mechanism linkage- leaving you with a pistol that won't fire. Inside the slide, the firing pin has a passive locking block, so unless you've pulled the trigger, the firing pin isn't going to doing anything it isn't told to. In short, it can't reach the primer without your permission. It also won't go off if dropped and so forth. The frame has a trigger guard with a squared profile, and the front face of it is grooved. My shooting buddies and I experimented with getting our support hand up on the gun and putting that index finger around the trigger guard. What we found was that, for most of us, it didn't help. But if you find it helps, the trigger guard is there for you. Behind the trigger guard is a magazine button, right where you'd want it. And inside is a swoopy-curved trigger. Remember, the Baby Desert Eagle II is a traditional double-action pistol, and for that curved trigger is better than a straight or straighter one. As your trigger finger cams the mechanism back, your finger slides on the trigger, and the geometry of the finger/trigger relationship stays the same. With a straighter trigger, you'd likely find the changing geometry causing your front sight to move, or at least I do. Stroking through on double action, the front sight for me stays right where I want it to. And on subsequent single-action shots, the shape of the trigger makes no difference. The grips are a hard polymer, with a non-slip pattern in them, as well as the IWI logo. Inside, the Baby Desert Eagle II uses the standard CZ-75 magazine, a magazine you can get anywhere, and which in its standard form holds 15 to 16 rounds. When I first fired the Baby Desert Eagle II, I was using mild-recoiling factory 115-grain full-metal-jacket ammo, which is really soft to shoot in lighter handguns. In the 41-ounce Baby Desert Eagle II, the low bore axis, and the mass of the pistol, combined to make it feel as if I had fired a .22 LR or something. Accuracy shooting was fun, and the trigger made it easy, too. The DA/SA mechanism is quite nice. You take up the slack, and then there is a small amount of rolling resistance as the trigger cams the sear off the hammer hooks. Like a good double-action revolver, there is no way to predict the hammer fall, so all you can do is focus on the front sight and follow-through, almost always for a good hit. I'll admit, as a daily concealed-carry pistol, the Baby Desert Eagle II would be a lot to carry. It might even be too much. However, as an open carry, duty or military sidearm, it would be exemplary. Compared to my traditional favorite, the 1911, the Baby Desert Eagle II with two loaded spare magazines would have the same weight as a Government model and its two spares. But you could have 46 to 50 rounds of 9mm, versus 25 of .45 ACP. Plastic may be fantastic, but there's a reason steel is still with us. And there are good reasons for all-steel handguns. The Baby Desert Eagle II is an example. Smallest avg. group: 115 gr. Hornady FTX- 2.0 in. Avg. of all ammo tested (9 types)- 3.0 in. Notes: Accuracy results are averages of four five-shot groups at 25 yards off an MTM K-Zone shooting rest.